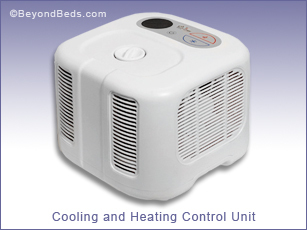 ChiliPad Cube 2.0 is a revolutionary heating and/or cooling system designed to regulate the surface temperature of your bed, within 1 degree increments between 60 -110 Fahrenheit. 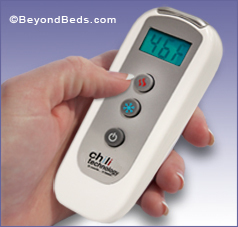 Using advanced semi-conductor technology, the ChiliPad enables you to adjust the temperature of your sleeping surface. The poly/cotton ChiliPad will fit any standard or extra thick mattress. 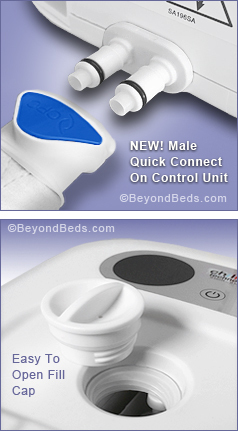 The pad contains thin, soft medical grade tubing attached to a built in connection hose which connects to the control unit. The control unit circulates the temperature regulated water throughout the pad. ChiliPad Helps You to Achieve Restful Sleep. Sleep researchers agree that a slightly cool sleeping temperature is desirable for a restful night's sleep because it parallels the body's natural drop in temperature. Thanks to ChiliPad's temperature-regulated water circulation system, you can now set the ideal temperature for staying in your sleep comfort zone all night long. No more kicking off the covers or battling with your spouse about whether the room is too hot or too cold. The dual zone ChiliPad features two independent wireless controls, enabling you and your partner to control your own desired temperature! Saves You Money On Energy Costs. Why cool your whole house when you can just cool your bed? With today's rising energy costs, that question is more relevant than ever. ChiliPad's new energy efficient Cube 2.0 control unit(s) average only 80 to 170 watts of energy use and will automatically shut off after 10 hours, thereby cutting your energy bill. And remember, ChiliPad heats as well as cools, so whether you're turning your thermostat down in the winter or up in the summer, you don't have to sacrifice a good night's sleep to save energy. How Does The Chili Pad Work? Similar to the semiconductor technology designed to cool computers, ChiliPad circulates a continual stream of water through tubes in the pad. You won't be discomforted by these tubes in any way, and you'll definitely appreciate their warmth or coolness. As the water flows by the sensor chip, it is either heated or cooled to the designated temperature. It's easy, automatic, and 100% safe (there is no electro-magnetic radiation risk). The ChiliPad fits all standard and extra thick mattresses, just like an ordinary mattress pad . The control unit is virtually noiseless, under 45 decibels (about the same sound as a computer fan), and is designed to have a white noise effect, which aids to drown out external sounds for a restful nights sleep. The hose that comes attached to the ChiliPad is 8 feet long. Warranty: 2 year manufacturer's | ETL listed. ( 90 day Money Back Guarantee).